If you are new to crossfit, you are probably wondering; first, what is Froning doing, and second, how to actually get into the world of WODs, intensity, discomfort and elite functional fitness. To be honest, it’s pretty simple. Google “crossfit wod” and hope for something easy. Challenging workouts and high intensity are what crossfit is best known for; shorter training routines performed at a higher heart rate (and usually accompanied by heavy breathing). Those workouts are called either WODs (workout of the day) or MetCons (metabolic conditioning). The goal is pretty clear: as fast or as many reps as possible in a certain time frame. If your first thought was “that seems to be pretty competitive”, you are right. 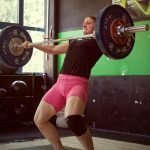 Crossfit WODs spike competitiveness in all levels of athletes: from newbies just starting crossfit to experienced pro athletes. Best way to kick off your new training journey is by joining a gym. You will get the exact guidance you need on how to safely and efficiently begin with your new training regime. Technique is the most important virtue and only experienced coaches can fix your movement in a way it fits your level, age, background, goals, etc. Besides, crossfit incorporates movements and skills from various sports: gymnastics, Olympic weightlifting, rowing, athletics, etc., and we all need someone to teach us that. In case for some reason you can’t find a box or a coach, here’s a couple of workouts you can do on your own. Let’s say you are new to strength training. Most likely your body is not trained to do all kinds of lifting, carrying, pushing and pulling. It’s extremely important to develop basic core strength and a certain level of pelvic stability before tackling on any of the famous crossfit workouts. Improved core strength and stability will reduce the risk of developing lower back pain or other spine related injuries. Here is a simple routine which will help you develop sufficient strength to later safely proceed with more demanding movements and WODs. The above mentioned core training is a great addition to a workout routine which includes the king of all exercises: the squat. Squat is the most important muscle building exercise and a great foundation for all kinds of activities and sports. This complex exercise will help you develop full-body strength, stability and flexibility, basically everything you need before starting crossfit. Keep in mind, squat is a skill. It does not matter how much you can lift, but how you lift the burden. Your torso should stay upright while your hips have to travel below parallel. Part 1: Work up to a heavy, but technically beautiful 3-repetition squat. Eventually as bodyweight squats get too easy, take a kettlebell and do goblet squats, hold the kettlebell in front of your chest, instead. You don’t have to do the core and squat routines only. There are a lot of beginner friendly workouts you can put into your training routine. Just make sure you don’t over-perform on those: 3 MetCons per week are more than enough. Annie is a couplet, made of two movements: sit ups and double-unders. If your DUs are still a skill you’re working on, do single-unders. While the WOD might look simple, 150 sit-ups will make it quite a challenge. As the name suggests, this workouts pushes you to the failure. Meaning, you are doing burpees for as long as possible. Continue in this order until you can no longer complete burpees for the number of minutes on the timer. Cindy is one of the most popular workouts out there. It’s a simple 3-set of pull ups, push ups and air squats. You can swap the pull ups for ring rows or bent over rows, and do wall-supported push ups instead of the regular ones. Besides kettlebell swings and pull ups, Helen in one workout that includes running. You can also change running for rowing or spinning. Just make sure you sweat a little. Tabata is a simple, and also a very popular one, workout routine to bring the intensity up and progressively train your body for other metabolic conditioning routines. Chose one exercise and perform it in 8 sets: 20 seconds of work, 10 seconds of rest. For example, take kettlebell swings. Perform as many swings as possible in the first 20 seconds. Take a 10-second rest. Repeat the set for seven more rounds. If you want to challenge yourself and train your body for crossfit, do burpees in a combination with one of the resistance exercises. Best workouts are actually pretty simple. When starting crossfit, set a goal of mastering the basics first. Once you get the basics, try to learn the more advanced movements. Focus on the technique and the movement. Ask yourself: does it look perfect?